Located in the south-eastern corner of France, 26km from the Spanish border, and contained in the small section of France that is part of Catalonia, Collioure has a distinctive French-Catalan culture. My love affair with France as a destination is something I’ve written about many times in the past. Its combination of culture, food, wine, weather, landscapes and outdoor activities make it arguably the world’s most desirable tourist location. The cosmopolitan cities of Paris and Lyon attract visitors for their pace and energy and the urban French experience, but in the towns and villages of France one gets to experience a slower paced French way of life that is altogether different. One of the most appealing of all of these towns is Collioure, located in the south-eastern corner of France, 26km from the Spanish border, and contained in the small section of France that is part of Catalonia, giving it a very distinctive French-Catalan culture that is very much in evidence through the town and region’s culinary produce. Historically, the town has been held by the Visigoths, the Counts of Roussillon and the Kings of Majorca, with the Knights Templar, the Cistercians and the Dominicans all settling and making their presence felt in the town before the Catalans took control of the region. However, the French gained supremacy of the region in 1642, a control they maintained ever since. Architecturally, all of these past influences have combined to leave a number of fortifications around the town including the Chateau Royal, the Madeloc Tower and Fort Saint Elme, all of which are open to the public. Up until the 15th century the town served as a major port, but following the discovery of the Americas the town declined industrially and gradually grew into the sleepy fishing village it is now, cradled between the Pyrenees on one side and the Mediterranean on the other, with its small centre a network of small medieval streets with pastel-coloured buildings of various builds, which have remained largely unchanged for the last century, with new developments for the tourist industry springing up in the surrounding hinterland. The old town’s beauty has to be seen to be truly appreciated and has attracted a multitude of artists over the years. Picasso, Matisse, Derain, Dufy, Chagall and Marquet, with Matisse and Derain leading the Fauvism movement during their period of time living there. Matisse said of the town: "In the whole of France, there is no sky as blue as the one above Collioure. I just have to open the shutters of my room and I have all the colours of the Mediterranean before me." And the great master was completely correct. In the summer months, the weather and light are close to perfection as they cast their glow across the bay and onto the multi-coloured architecture. And that beauty continues to attract artists with 30 galleries and numerous painters making Collioure – known as the City of Painters - their base. A stroll around the old town brings you into direct contact with this community and the work they produce. The Museum of Modern Art, open since 1930, also displays art of the 20th century, while fans of Fauvism can take tours of the town to uncover the particular areas that inspired both Matisse and Derain. Collioure is also located in the heart of the Roussillon wine region, and as such produces a mixture of red, rose and white wine from the Grenache noir, Mourvedre, Syrah, Carignan and Cinsault grapes. It’s not one of the most celebrated of French *wine regions, but that said there are some local gems to uncover, with full-bodied and tannin-strong flavours. Bordering town Banyuls also produces a sweet red, which has marked itself out as one of France’s best dessert wines. One of the best places to taste the wines on offer is Le Neptune restaurant: Set on a hill overlooking the harbour, with indoor and outdoor seating, the location is the best of any eatery in town, with a menu that serves up a number of local delicacies - including hand-filleted and preserved anchovies - all paired with a selection of local wine. The Casa Gala Restaurant – found in the heart of the art district – is the place to sample the Catalan influence on Collioure’s gastronomy, with an endless array of tapas on offer such as: Serrano ham, garlic and tomato bread, patatas bravas, snails, squid and potato croquettes all washed down with white wine sangria. Perhaps Collioure’s biggest draw, however, is the stunning Vermilion coast and the many beaches that dot the coastline in the town itself and also to the north at Argelès-sur-Mer and the south at Banyuls. There are countless coves to enjoy, including two right in the heart of Collioure town. One can also walk the coastal path from Collioure to Banyuls, known as the Chemin des Douaniers – the smuggler’s path that was in operation for bringing contraband across the Spanish-French border. Along the route there a number of almost deserted beaches and on arrival at Banyuls one finds of the most beautiful beaches in the region, where there is the possibility to rent kayaks and explore the coast a little more from the water. When one tallies up all that Collioure has to offer – the history, the art, the wine, the gastronomy and the jaw-dropping coastline – paired with a Mediterranean climate and prices that are very affordable, it’s not too hard to see why this little gem of a town draws so many admiring glances and tourists to its shores. How to get there: Aer Lingus operate four direct flights a week from Dublin to Perpignan, which is just a 30-minute drive to Collioure. Perpignan is much more than just an airport hub with plenty to offer as a destination in itself. 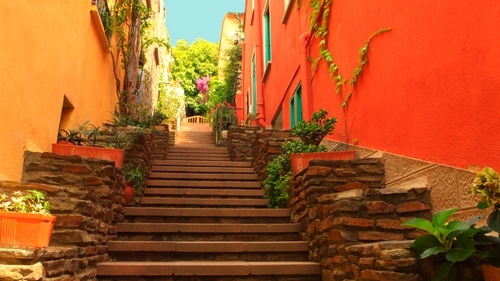 A day trip here at the beginning or end of your stay in Collioure is highly recommended. During a walk around the historical centre you can take in the cathedral with its ornate gold interior as well as the 14th century Town Hall. The nearby Palace of the Majorcan Kings is also worth an hour’s exploration for its impressive yellow- and red-brick stonework and panoramic views out over the surrounding town and the Pyrenees. Café de Vienne, located near the old town, is the place to experience a traditional bistro of the region.